Professor Kazuaki Ishihara (Ishihara team Nagoya University) has succeeded in enantioselective cyanosilylation with less reactive ketone by creating chiral lithium phosphoryl phenoxide supramolecular catalysts and developed a new synthetic way to obtain α-cyanohydrins which can be chemically transformed to chiral compounds with a tetra-substituted chiral carbon. This could lead to new synthetic routes to produce a wide variety of drugs and agricultural chemicals that have been difficult to synthesize. Their findings were published on Angewandte Chemie International Edition, Early View, DOI: 10.1002/anie.201510682, titled “Enantioselective Cyanosilylation of Ketones with Lithium(I) Dicyanotrimethylsilicate (IV) Catalyzed by a Chiral Lithium(I) Phosphoryl Phenoxide”and followed by a press release from Nagoya University and Kagaku Kogyo Nippo. Professor Kazuaki Ishihara (Ishihara team, Nagoya University) has developed an effective synthesis method for amides that can be used for drug, fiber and other various areas. They cooperatively combined boronic acids with a nucleophilic agent, 4-(N, N-dimethyl amino) pyridine N-oxide (DMAPO), allowing the synthesis condition to be more moderate and reducing the production cost by eliminating the separation process of byproducts. This can be applied to synthesize Sitagliptin, an antidiabetic drug. Their findings were published on Chem. Sci., 2016, Advance Article, DOI: 10.1039/C5SC03761A, titled “Boronic acid-DMAPO cooperative catalysis for dehydrative condensation between carboxylic acids and amines”, and followed by Chunichi Shinbun and Nikkan Kogyo Shinbun. Professor Shigehiro Yamaguchi (Yamaguchi team Nagoya University) has succeeded in creating a new photo-resistant fluorescent dye（C-NaPhox） that allows us to practically use STED (stimulated emission depletion) microscopy for visualizing live subcellular organelles, a few dozen nanometers in size. They have found that the dye molecule designed by using P atom as a key component has much higher photo-resistance than conventional fluorescent dyes and hardly shows color deterioration in STED imaging. It is expected that the dye would help improve STED technique to a practical level and establish the technological basis for high-resolution imaging of a lot of in vivo phenomena. Their findings were published on Angewandte Chemie International Edition, Early　View, DOI: 10.1002/anie.201507939, titled “A Phosphole Oxide Based Fluorescent Dye with Exceptional Resistance to Photobleaching: A Practical Tool for Continuous Imaging in STED Microscopy”. Nagoya issued a press release. Professor Shinichi Ohkoshi (Ohkoshi team) has succeeded in creating the smallest hard magnetic ferrite (εFe2O3 magnetic nanoparticles). With its strong magnetic coercive force (5 kOe at 8 nm particle size), the new material can be used for ultrahigh density magnetic recording media, especially for future magnetic tape storages for big data archives that lately draw a lot of attention from industries. And using its faint color feature, it can be applied for transparent color magnetic materials and toners. Their findings were published on Scientific Reports 5, Article number: 14414 (2015)　doi:10.1038/srep14414, titled “Nanometer-size hard magnetic ferrite exhibiting high optical-transparency and nonlinear optical-magnetoelectric effect”. The University of Tokyo issued a press release. Professor Kazushi Mashima, associate professor Hayato Tsurugi and Dr. Taiga Yurino (Mashima team, Osaka University) and Director Dr. Kazuhiko Sato, Dr. Shinji Tanaka and Dr. Yoshiki Shimizu (Interdisciplinary Research Center for Catalytic Chemistry, AIST) have succeeded in creating nickel-nanoparticle catalysts using organic silicon compound developed on their own and applied to the formation of an aromatic carbon-carbon　bond. They also have revealed that only amorphous nanoparticles are active and after reaction, nickel ions can be reduced and returned to the particles, resulting in the establishment of a catalyst cycle system. The catalyst, which is affordable and easily available, is expected to be applied to synthesize aromatic conductive polymer and drugs, or next generation nanoparticle materials such as nano machines and quantum dots. Their findings were published on Angewandte Chemie International Edition, Early　View, DOI: 10.1002/anie.201507902, titled “Salt-Free Reduction of Nonprecious Transition-Metal Compounds: Generation of Amorphous Ni Nanoparticles for Catalytic C-C Bond Formation”. Osaka University and JST issued a joint press release. Professor Kazushi Mashima and associate professor Hayato Tsurugi (Mashima team, Osaka University) have designed and created a new organometallic catalyst using magnesium, a metal that is affordable, easily available and less poisonous. With this catalyst, they have succeeded in isomerizing hydrocarbons based on activation of carbon-hydrogen bonds and selectively obtaining allenes or internal alkenes from terminal alkenes. Their findings were published on Chemistry - A European Journal, Article first published online: 26 MAR 2015, DOI: 10.1002/chem.201500179, titled “Organomagnesium-Catalyzed Isomerization of Terminal Alkynes to Allenes and Internal Alkynes”. Osaka University and JST issued a press release. Professor Naotoshi Nakashima (Nakashima team, Kyushu University) has succeeded in creating new organic n-type thermoelectric materials with light and flexible properties, using carbon nano tubes (CNTs). CNTs essentially have a p-type thermoelectric property and need dopants if n-type materials are required. But it is difficult to ensure stability because the dopants easily desorb from the surface of the n-type materials. In order to solve this problem, they have chosen cobaltocene as a dopant and created a new technique to put it into the inner space of CNTs. The obtained thermoelectric figure of merits (ZT) 0.16 is highest among the reported n-type organic thermoelectric materials. The lower ZT and less stability of organic thermoelectric materials are a big challenge for practical applications. The team plans to improve these properties in order to apply CNT materials for the use in energy conservation fields. The report of these findings was published on Scientific Reports, 22 January 2015, doi 10.1038/srep07951, titled“Development of n-type cobaltocene-encapsulated carbon nanotubes with remarkable thermoelectric property”. Kyushu University issued a press release and covered by Nikkan Kogyo Shinbun. Professor Kazuaki Ishihara (Ishihara team, Nagoya University) has succeeded in establishing a new technology that makes it possible to produce highly purified α-quaternary di-substituted amino ester derivatives, compounds which are especially difficult to synthesize among chiral amino acids. They examined an unusual selective C-alkyl addition to α-imino esters (raw materials) and found that Zinc(II)ate complexes obtained by combining Grignard reagents (RMgX) with Zinc chloride are quite effective. Zinc (II)ate complexes consist of a Lewis acid moiety [MgX]+, a nucleophilic moiety [R3Zn]- and two [MgX2] moieties and the ionically separated [R3Zn]- can selectively, quickly attack the imino carbon atom, which is strongly activated by chelation of [MgX]-. And introducing a bulky 8-phenyl-menthyl group as the imino esters’ alcohol group gives the perfect disastereoselectivity of the C-alkyl addition, leading to the corresponding chiral α-quaternary di alkyl substituted amino acid derivatives in high yield. With this method, substituting the imino carbon with a β,γ-alkynyl group would enable us to get various functional groups by reacting its active triple bond. An amino-acid library given by this method can be applied to the synthesis of some small-molecule or peptide medicines, the screening of new medicines by using chiral building blocks for fine chemicals and other practical developments. A paper titled “C-selective and Diastereoseletive Alkyl Addition to β,γ-Alkynyl-α-imino Esters with Zinc(II)ate Complexes” was published on Angewandte Chemie International Edition, 16 January 2015, doi 10.1002/anie.201408916. The Chunichi Shinbun, Nikkan Kogyo Shinbun and Kagaku Kogyo Nippo introduced these findings. Professor Naotoshi Nakashima (Nakashima team, Kyushu University) has developed a solubilizing agent composed of supramolecular metal complexes that have an ability to separate high-purity semiconducting CNTs (carbon nano tubes). The agent can be recycled and reusable. With their high electron mobility and diverse band gaps, semiconducting CNTs are expected to be materials for low-power driven semiconductors or next-generation solar power. A paper titled “Semiconducting single-walled carbon nanotubes sorting with a removable solubilizer based on dynamic supramolecular coordination chemistry” was published on Nature Communications doi: 10.1038/ncomms6041 03 October 2014. Kyushu University and JST issued a joint press release, which was covered by Kagaku Shinbun, Nikkei Sangyo Shinbun, Nikkan Kougyo Shinbun, Zaikei Shinbun etc. Professor Naotoshi Nakashima (Nakashima team, Kyushu University) has succeeded in reducing the content of platinum catalyst for polymer electrolyte fuel cells to one-tenth by decreasing catalyst’s particle size, concentration and increasing specific surface area. To do this, they used a layering technique in which platinum catalyst is dispersed onto CNTs (carbon nano tubes) pre-coated with polybenzimidazole (PBI) as an adhesive. A paper titled “Enhancement of Platinum Mass Activity on the Surface of Polymer-wrapped Carbon Nanotube-Based Fuel Cell Electrocatalysts” was published on Scientific Reports 4,　doi:10.1038/srep06295 05 September 2014. Kyushu University and JST issued a joint press release, which was covered by National Institute for Environmental Studies (Environmental Information Department), Nikkei Sangyo Shinbun, Nikkan Kougyou Shinbun, Kagakukougyo Nippou (The Chemical Daily) etc. Professor Ishihara (Ishihara Team, Nagoya University) has developed the new oxidative cyclization of a chiral 6 membered ring and succeeded in highly chemo- and enantio-selective synthesis of bio-active chroman structures, which are usually included in natural anti-oxidants like vitamin E (α-tocopherol). Most of the chromans are chiral compounds. For a commercial production, you need to find a method of synthesis that can allow us to selectively obtain pharmacologically-active chiral isomers. Instead of using conventional metal-chelate catalysts, Ishihara team paid attention to iodine, which is an abundant and eco-friendly source in Japan. Using iodine, they have succeeded in creating the method by designing a deep structural pocket like enzymes with chiral hypoiodite salts and building an in situ regeneration system of oxidation catalysts. They also have shown that the addition of potassium carbonate can improve the catalyst’s turnover (TON) up to 10 times and more to reduce the catalyst content drastically. These findings are expected to be utilized for the production process of medicines and the research and development of new drugs. A paper titled “High-turnover hypoiodite catalysis for asymmetric synthesis of Tocopherols” was published on Science 18 July 2014: Vol. 345 no. 6194 pp. 291-294 DOI: 10.1126 and Nagoya University and JST issued a joint press release, which was covered by newspapers such as Chunichi, Asahi, Kagaku-kogyo, Nikkan-kogyo and C&EN (Chemical & Engineering News). A book titled “Material Revolution - Nano Architectonics” by Dr. Ariga (Ariga team, National Institute for Materials Science (NIMS)) was published by Iwanami Shoten. Dr. Katsuhiko Ariga (Ariga team, National Institute for Materials Science (NIMS)) has succeeded in visualizing the distribution of absorbed cesium in plant cells. When "cesium green", the luminescent probe they have developed, is applied to Arabidopsis’s cotyledon that has been grown in culture media including cesium carbonate, the accumulation of cesium in the cotyledon’s vacuole is detected with the green light emission. With this approach, it is expected to figure out the mechanism of transportation and accumulation of cesium in plants and help improve plant capacity to absorb cesium. The findings are scheduled to be published on ACS-Applied Materials & Interfaces. NIMS have issued a press release, followed by the newspapers such as Yomiuri and Mainichi as well as NHK. Professor Itaru Hamachi (Kyoto University) and associate professor Masato Ikeda (Gifu University) (Hamachi team) have succeeded in creating new gel hydrogels that can recognize complex biomolecules targeted as disease biomarkers. Hydrogels are highly biocompatible and are expected to be applied to various medical treatments and diagnoses by adding highly sophisticated functions. Until recently, however, biomarkers were limited to simple molecules and a new gel material should be designed and prepared for each biomarker. Hamachi team has created a new type of hydrogel that is soluble under a specific reaction condition by embedding it with a reaction-inducing active enzyme. While only one sort of gel material is required to produce the hydrogel, the targeted biomarker molecule is changed just by selecting the corresponding embedding enzyme in the hydrogel. With this unique technique, the team has successfully produced a variety of soluble gels that can distinguish several kind of biomolecules (biomarkers) relating to diabetes, prostate and gout. Besides, by mixing two different reactive gel materials and several species of enzyme, the team has developed hydrogels that can find a specified biomarker even when there are some different types. As smart gels, these hydrogels could provide broader contribution in developing materials for diagnosis and drug delivery system leading to medical applications. The findings were published online as Nature Chemistry’s article, doi:10.1038/nchem.1937. (2014), titled “Installing logic-gate responses to a variety of biological substances in supramolecular hydrogel-enzyme hybrids”. Kyoto University, Gifu University and JST have issued a joint press release, covered by newspapers like Nippon Keizai, Kyoto, Gifu, Nikkan Kogyo and Kagaku Kogyo Nippo. 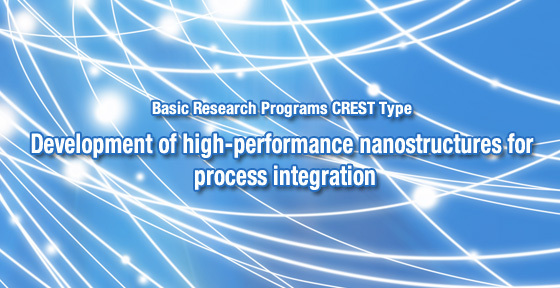 The enrollment of the 4th symposium on this research area "Development of high-performance nanostructures for process integration" has been started. Please sign up yourself through the following website. Professor Naotoshi Nakashima (Nakashima team Kyushu University) has succeeded in decreasing the amount of platinum catalyst for polymer electrolyte fuel cells (PEFC). Their own approach makes it possible to reduce the size of platinum catalysts down to 1.2 nm and improve the catalysts' activity up to 8 times as high as the exiting catalysts. The findings have been published by Nikkan Kogyo Shinbun and Nikkei Sangyo Shinbun. Professor Shin-ichi Ohkoshi (Ohkoshi team, the University of Tokyo) has created a chiral photomagnet and found it has the ability to switch the polarization of second-harmonic by 90 degree upon irradiation of blue light or red light. The photomagnet is a chiral structured complex with cyanide-bridged Fe(II) and Nb ion and its magnetic properties can be reversibly switched by irradiating with blue and red light that cause reversible spin-crossover on the Fe(II) ion. A study of second-harmonic generation, a nonlinear optical effect has revealed that the vertical polarization plane is switched to horizontal polarization by irradiating blue light, while reversibly returned to the vertical polarization with red light. The observed optical switching is expected to provide a new approach on development of magneto-optical memory and optoelectronic devices. A paper titled "90-degree optical switching of output second-harmonic light in chiral photomagnet" has been published on Nature Photonics doi:10.1038/nphoton.2013.310, 24 November 2013. The university Tokyo and JST have issued a joint press release, covered by newspapers such as Nippon-Keizai, Nikkei-Sangyo and Kagaku-Kogyo. Professor Shigeru Yamago (Yamago team Kyoto University) has succeeded in creating a ball-like benzene-linked 3D structure molecule by using their own synthesis technique. The molecule can be obtained with reductive elimination of platinum from a precursor complex with an octahedral shape composed of 6 platinum atoms and 4 benzene units formed in a self-assembling manner. There have already been many kinds of supramolecular transition metal complexes formed by similar self-assembling techniques. Combined with their reductive/elimination method, we could create a variety of new 3D πconjugated molecules with different structures which are difficult to obtain using conventional synthetic methods. The findings are published on Nature Communications 29 October 2013, doi:10.1038/ncomms3694, titled “Synthesis and physical properties of a ball-like three-dimensional π-conjugated molecule”. Kyoto University, Japan Synchrotron Radiation Research Institute (JASRI) and JST issued a joint press release, followed by newspapers such as Nikkan-Kogyo and Nikkei-Sangyo. Professor Naotoshi Nakashima (Nakashima team Kyushu University) has presented the empirical equations to determine the electronic/redox potentials of single-walled carbon nanotubes (SWNTs). Based on the experimentally-determined data ranging from 0.62 nm to 1.1 nm in diameter using their own method, “in situ PL electrochemical analysis”, they have established the empirical equations that can be applied to the expanded range 0.5-2.5 nm where the PL analysis is quite difficult. These equations are expected to help develop applications of SWNT materials in various fields. A paper titled “Empirical prediction of electronic potentials of single-walled carbon nanotubes with a specific chirality (n,m)”has been published on Scientific Reports, Oct.16,2013 DOI:10.1038/srep02959 and Kyushu University issued a press release on this. Professor　Kazuaki　Ishihara（Ishihara team Nagoya University) have found that primary alkyl boronic acids such as methylboronic acid and butylboronic acid are greener and highly active catalysts for the dehydrative amide condensation of α-hydroxycarboxylic acids. Unlike the present two-step reaction, this can help develop a large-scale commercial process in a single reaction with less waste. The results have been published on Org. Lett., 2013, 15 (14), pp 3654-3657,DOI: 10.1021/ol401537f DOI: 10.1021/ol401537f, June 26, 2013, titled "Primary Alkylboronic Acids as Highly Active Catalysts for the Dehydrative Amide Condensation of α-Hydroxycarboxylic Acids" and covered by Chunichi Shinbun. Professor Kazuaki Ishihara (Ishihara Team Nagoya University) have developed metal-free and newly modified asymmetric hypervalent-iodine catalysts that have the ability to synthesize optically-active spirolactone derivatives in as high as 99% yield, which can be used for potential intermediates for developing certain types of drugs. They have found the reaction conditions can be improved like the shorter reaction time by half and the smaller catalyst amount of 1-5 mol% as compared with their existing iodine catalysts. The structural analysis has revealed that the catalysts have a flexible conformation folded with intramolecular hydrogen bonding, being transformed to an optimal substrate-induced reaction site (an induced-adaptability function) to accelerate the reaction. They also have found that the addition of an alcohol suitable for the electric nature of a reactant can adjust the stability of its reaction intermediate. The findings were published on Angewante Chemie Early View 19 JUL 2013 DOI: 10.1002/ange.201303559, titled "Hydrogen Bonding and Alcohol Effects in Asymmetric Hypervalent Iodine Catalysis: Enantioselective Oxidative Dearomatization of Phenols" and covered by the Chunichi Simbun and Kagaku Kogyo Nippo. Dr. Katsuhiko Ariga (Ariga team National Institute for Materials Science(NIMS)) have succeeded in developing a new and simple technology that makes it possible to analyze chirality and enantiopurity by using a nuclear magnetic resonance spectroscopy (NMR) and the symmetric achiral porphyrin derivatives they have created. The technical feature is that hydrogen bonding of a chiral molecule to be measured and the porphyrin derivative causes the proton conformation at the porphyrin's β-pyrrole position to be asymmetric, leading to the splitting of the proton NMR signals. They also have found the splitting widths are proportional to the enantiopurity of chiral materials and the technique can be applied to the measurement of a wide variety of chiral molecules such as carboxylic acids, esters and amines. This approach can replace some of the current protocols on NMR measurements by transforming enantiomers to the corresponding diastereomers. The findings have been published on Nature Communications 4, Article number: 2188 doi:10.1038 /ncomms3188, 17 July 2013, titled "NMR spectroscopic detection of chirality and enantiopurity in referenced systems without formation of diastereomers", and covered by NIMS’s press release. Professor Kazuaki Ishihara (Ishihara Team Nagoya University) have developed the new dehydrative amide condensation of α-hydroxycarboxylic acids. Until recently, there has been the problem in a direct synthesis of amines and carboxylic acids that the stable ammonium salts formed by mixing of the amines and acids can inhibit their dehydrative condensation. They have found, however, that primary alkyl boronic aids such as methylboronic acid and butylboronic acid are highly effective as catalysts, gaining more than 90% yield. This can lead to a new way of synthesizing new drugs such as optically active β-aminoalcohols (the materials for chronic-cardiac-failure drugs) by reducing optically-active α-hydroxyamides. The findings were published on Org. Lett., 2013, 15 (14), pp 3654-3657 DOI: 10.1021/ol401537f, June 26, 2013, titled "Primary Alkylboronic Acids as Highly Active Catalysts for the Dehydrative Amide Condensation of α-Hydroxycarboxylic Acids" and followed by Kagaku Kogyo Nippo. Professor Naotoshi Nakashima (Nakashima team Kyushu University) have succeeded in developing a new type of long-term durable middle/high temperature polymer electrolyte fuel cell (PEFC) by doping poly(vinylphosphonic acid (PVPA) in place of phosphoric acid. Middle/high temperature PEFCs have higher performance in power generation efficiency without humidification and cooling operations than low temperature PEFCs. But, they have a problem with long term durability because doped phosphoric acid used for proton transfer source can easily leach from polymer electrolyte membrane and catalyst layers. They have developed a new type of middle/high temperature PEFC free from acid leaching with remarkably high durability(single cell test 400,000 cycling at 120℃ under a non-humidified condition). The PEFC is composed of a membrane electrode assembly with Pt on PVPA-doped poly[2,2'-(2,6-pyridine)-5,5'-bibenzimidazole] wrapped on carbon nanotube (their own bottom-up assembling technique) and poly(vinylphosphonic acid)-doped polybenzimidazol for the electrocatalyst and electrolyte membrane, respectively. These findings were published on Scientific Reports 3, Article number:1764 doi:10.1038/srep01764, entitled "Remarkably Durable High Temperature Polymer Electrolyte Fuel Cell Based on Poly(vinylphosphonic acid)-doped Polybenzimidazole". Kyushu University has issued a press release, followed by newspapers such as Nikkei, Yomiuri, Nishinippon and Nikkan-kogyo. Recently Nature Asia covered the paper as a topic. Professor Kazuaki Ishihara (Ishihara　team, Nagoya University ) have developed self-assembled supramolecular chiral-catalysts by just mixing Mg ion (an essential mineral element in the body) with optically-active alcohols（easily available and less expensive） with a molar ratio of 2/3. They have found that in the additive reaction of organic phospholyl compounds into unsaturated carbonyl compounds, these catalysts can give optically-active β-hydroxy-phosphonicacids or α-hydroxyphosphonic acid esters in high selectivity, based on the substrates to be used. Optically-active β-hydroxy-phosphonic acids can be transformed to P, N-ligands which are likely used for development of new chiral catalysts. And Optically-active α-hydroxyphosphonic acid esters are known as the key intermediates for the synthesis of inhibitors blocking hydrolases such as proteases and esterases and are expected to help create new drugs. These catalytic reactions can be widely applicable for practical use because of their reproducibility in gram-scale and easy-to-do operations. Enzymes are highly-functional and environmentally-benign catalysts but it is quite difficult to design and synthesize an enzyme-like catalyst having ten-to-hundred thousand molecular weight and an elaborate key-hole. Like these findings, Ishihara team have been working on design and development of sophisticated catalysts by using a self-assembling function in which several kinds of pre-designed molecules congregate to one supramolecular complex in a flask. A paper titled "Chiral Magnesium(II) Binaphtholates as Cooperative Br?nsted/Lewis Acid?Base Catalysts for the Highly Enantioselective Addition of Phosphorus Nucleophiles to α,β-Unsaturated Esters and Ketones " was published on Angew. Chemie (Early View)　Article first published online: 13 MAR 2013 DOI: 10.1002/ange.201300938 and Nagoya University and JST issued a joint press release, followed by newspapers such as Chunichi, Asahi, Nikkan-Kogyo and Kagaku-Kogyo-Nippo. Dr. Ariga (Ariga team, National Institute for Materials Science) have succeeded in developing a drug delivery system by implanting a gel material under the skin that can release a drug in response to an applied pressure by hand. Drugs are usually given orally or by injection, which sometimes cause adverse effects or are inconvenient to use. They have found that an antiemetic drug (ondansetron) put in the gel material is released with a finger-like pressure and is effective at least for 3 days. This pressure-induced drug treatment could help patients take drugs orally even when they feel like vomiting due to anti-cancer drug medication. The gel material is produced by bridging alginic acids with cyclodextrins, both of which are available naturally. The cycldextrins work as hosts for a guest drug to be released. A paper titled "β-Cyclodextrin-crosslinked alginate gel for patient-controlled drug delivery systems: regulation of host-guest interactions with mechanical stimuli " was published on Journal of Materials Chemistry B, 2013, 1, 2155-2161 DOI: 10.1039/C3TB00503H 14 Feb 2013, and National Institute for Materials Science issued a press release. Professor Akira Harada (Osaka University Harada team) has succeeded for the first time in forming a gel assembly (several cms in diameter) via metal-ligand interactions using polyacrylamide modified with Fe-porphyrin and L-histidine moieties. The assembly can be detached by the addition of aqueous histidine solution and attached again by washing. This shows we can realize a reversible self-assembly system of gels through metal-ligand interactions. A paper titled "Reversible self-assembly of gels through metal-ligand interactions" was published on Scientific Reports 3,Article number:1243doi:10.1038/srep01243, 07 February 2013 and Osaka University issued a press release. Dr. Katsuhiko Ariga (National Institute for Materials Science Ariga Team) has developed fullerene crystals with a lot of nanopores. The prospect of fullerene materials is quite promising, especially for the electronic application, but the challenge now is to develop and control their fine structure with larger surface areas that can lead to high performance. They have succeeded in producing fullerene crystals with a lot of nanopores and surface areas about ten times as large as those of existing crystals by using a simple approach to crystalize fullerene from mixed solvents. This could be applied to new materials for secondary cell carbon electrodes and higher hole transportation capacitors. The findings were published on J. Am. Chem.Soc., 2013, 135 (2), pp 586-589　DOI: 10.1021/ja3108752, titled "Fullerene Crystals with Bimodal Pore Architectures Consisting of Macropores and Mesopores". Dr. Katsuhiko Ariga (National Institute for Materials Science Ariga Team) has developed fluorescent probes to visualize Cesium distribution on solid surfaces and in the body of living organisms with an accuracy of less than 1mm. A paper titled "Micrometer-level naked-eye detection of cesium particulates in the solid state" was published on Science and Technology of Advanced Materials Volume 14 Number 1、2013 doi:10.1088/1468-6996/14/1/015002. Professor Jiro Abe (Abe team Aoyama Gakuin University) has succeeded in developing a new technology of controlling the movement driven by light, a technology that can make it possible by light to move freely a graphite plate magnetically levitated. With its repulsion force to magnet, diamagnetic materials are known to be levitated once being placed on a strong magnet. Diamagnetic graphite's susceptibility depends on the change in temperature because of its photo-thermally induced energy. They found the gap between the levitated graphite plate and the magnet decreased upon light irradiation, as its photo-thermally-induced susceptibility increased and vice versa. They also found the plate's motion in two dimensions can be controlled by light.at their disposal like rotating the plate by sunlight at a higher speed more than 200 rpm. Another characteristic of the technology is that the commercially available and less expensive neodymium magnets can be used instead of the strong superconducting magnets. The technology is expected to be applied to material transportations by light, light driven actuators as well as a new solar power generation. The findings were published as a paper entitled "Optical Motion Control of Maglev Graphite" on J. Am. Chem. Soc., 2012, 134 (51), pp 20593-20596　DOI: 10.1021/ja310365k December 12, 2012 and followed by Asahi, Mainichi, Nikkankogyo, Kagakunippo, TBS, Wall Street Journal and so on. Professor Akira Harada (Harada　team Osaka University has developed gel actuators bending, contracting and expanding in response to the change in wavelengths of light. The actuators are polymer hydrogels composed of cyclodextrin (dextrinecyclic polysaccaride) as a host molecule and azobenzene derivatives as a photo-responsive guest molecule for sensing and controlling. Referring to the biological functions such as morphology transformation and signal amplification activated by selective self-assembling and concerted effects, they have realized a photo-responsive transformation using a host-guest reversible interaction. This is the first case where control of micro-level molecular recognitions induced by photo-stimuli can lead to macro-level transformations of materials. It is expected that the photo-responsive stretchable gel actuators will be used for the development of functional materials or medical materials. These findings were introduced as an article on Nature Communications 3, 1270doi:10.1038/ncomms2280, 11 December, entitled "Expansion-contraction of photo-responsive artificial muscle regulated by host-guest interactions”. Osaka University issued a press release, followed by Yomiuri newspaper. Professor Jiro Abe (Abe team, Aoyama Gakuin University) has succeeded in creating a new holographic material that can lead to recording/reproducing of a real time dynamic 3D display. Holography is a technology that can produce natural 3D images and has been employed as shiny 3D images/figures of credit cards and bills to prevent copying. Actually, the images/figures are being encrypted and recorded into some specific holographic materials where 3D images are coming up upon irradiation. Right now the holographic technology is limited to some sort of exhibits and art works, or anti-counterfeiting using its anti-reproducibility. However, new holographic materials that enable real time recording/reproducing of cords have been studied since they can realize the development of televisions for 3D movies. Abe team has succeeded in creating the materials using photochromic compounds they independently have developed that are colored on irradiation and become colorless without irradiation at high speed. The holographic materials will allow us to make wider screen films and are expected to be applied to a new type of systems like 3D displays, entertainment devices as well as light induced computer chips. These findings were published on Scientific Reports 2,Article number:819doi:10.1038/srep00819,08 November 2012 under the heading of "A real-time dynamic holographic material using a fast photochromic molecule". Aoyama Gakuin University and JST issued a press release, followed by newspapers such as Nikkan Kogyo, Kagaku Kogyo Nippoh, Asahi Shinbun Digital, Nikkei Press Release in electronic version, and Jiji dotcom etc. Professor Naotoshi Nakashima (Nakashima team, Kyushu University) demonstrated how to assess quantitatively the interaction between single-wall-carbon nanotubes and molecules in a thermodynamic analysis. They determined thermodynamic properties (ΔG、ΔH and ΔS) for the exchange reactions of sodium cholate on four different chiralities of SWNTs for the DNAs. They found that 1) the dC5 exhibited an exothermic exchange, whereas the dC6,8, 10, 15, and 20 materials exhibited endothermic exchanges, and 2) the energetics of the dC4 and dC7 exchanges depended on the associated chiral indices and could be endothermic or exothermic. This method is applicable to any molecule that interacts with nanotubes. The study opens a way for science of carbon nanotube thermodynamics. A paper entitled ""Thermodynamics on soluble carbon nanotubes: How do DNA molecules replace surfactants on carbon nanotubes?" was published on Scientific Reports 2, Article number:733 doi:10.1038/srep00733,12 October 2012 and Kyushu university issued a press release on these findings. Professor Shi-ichi Ohkoshi (Ohkoshi team. the University of Tokyo) succeeded in creating a high performance ferrite magnet with a gigantic coercivity, composed of rhodium-substituted ε-Fe2O3, ε-RhxFe2-xO3 prepared by substituting part of Fe3+ with Rh3+ from ε-Fe2O3. Its biggest coercivity(31kOe at room temperature) among ferrite magnets is comparable to those of rare-earth magnets. They found the magnet can work for magnetic rotation devices that use high frequency millimeter wave since the magnet exhibits a rotation of the polarization plane of the propagated millimeter wave at 220 GHz upon irradiation. This frequency is one of the promising carriers called "the window of air" for millimeter wave wireless communications due to its less absorbable property by air. Until recently, there have not been magnetic materials that can absorb such a high frequency magnetic wave. In a world of the next-generation wireless millimeter communications using high-definition television systems or wireless intra-board integrated circuits, the magnet is expected to play a big role as high frequency millimeter absorbers or magnetic rotators like isolators and circulators to overcome so-called "electromagnetic interference challenges". These findings were reported in a paper "Hard magnetic ferrite with a gigantic coercivity and high frequency millimetre wave rotation",Nature Communications Volume:3,Article number:1035 DOI:doi:10.1038/ncomms2038, Published04 September 2012 and covered by Nikkei-Sangyo and Nikkan-Kogyo news papers. Professor Kazuaki Ishihara (Ishihara team Nagoya University) succeeded in creating unprecedented water-condensation catalysts (N,N-diarylammonium pyrosulfate) that enable us to use water as a solvent for the production of the ester derivatives conventionally used for polyester-resin monomers. They had focused on natural enzymes' hydrophobic active centers that allow various kinds of aqueous in vivo reactions and found that the combined structure of weakly basic diarylamines having hydrophobic bulky substituents with a pyrosulfate functioning as an active site was highly effective to remove the influence of water, i.e. the condensation reaction inhibitor. The catalysts system is expected to be applied to a wider range of industrial chemical processes. These findings were reported in a paper entitled "Hydrophobic N,N-diarylammonium pyrosulfates as dehydrative condensation catalysts under aqueous conditions" Org. Lett. 2012, 14(1), 30-33. DOI: 10.1021/ol2027366 and “N,N-Diarylammonium pyrosulfate as a highly effective reverse micelle-type catalyst for hydrolysis of esters” Org. Lett. 2012, 14(12), 3194-3197. DOI: 10.1021/ol301290c and followed by Kagaku-kogyo newspaper. Professor Kazuaki Ishihara (Ishihara team, Nagoya University) developed a new, highly-selective and greener way in a study of Baeyer-Villiger oxidation reaction conventionally used for synthesizing ε-caprolactone that leads to ε-caprolactam, i.e. one of nylon resin's raw materials. While peracetic acid is industrially used as an oxidant, there are the risk of its explosiveness and a problem of how to remove its by-products (carboxilic acids). They found the combination of hydrogen perxoide and pro-oxidants like lipotic Li [B(C6F5)4] or Ca [B(C6F5)4]2 helps solve such challenges. These findings were reported in a paper entitled "Baeyer-Villiger Oxidation and Oxidative Cascade Reactions with Aqueous Hydrogen Peroxide Catalyzed by Lipophilic Li[B(C6F5)4] and Ca[B(C6F5)4]2" published on Angewante Chemie International Edition, Article first published online:15 Aug 2012, DOI:10.1002/anie.201204286. which was covered by Kagaku-Kogyo, Nikkan-Kogyo and Chunichi newspaper. Professor Kazuaki Ishihara (Ishihara team, Nagoya University) developed a new way of synthesizing esters which are used as materials of polyester resin, fiber and pharmaceutical products with colorless, non-toxic and in situ generated lantanum(III) nitrate catalysts. Conventional transesterification catalysts such as tin and antimony are unfit for producing pharmaceutical products due to their toxicity, and titanium catalysts are inept in polyesterfiber production because of their coloring problem. They found that addition of ammonium salts or phosphonium salts could help boost the activity of lantanum nitrate into practical use. These findings were reported in a paper entitled "In situ generated “lanthanum(III) nitrate alkoxide” as a highly active and nearly neutral transesterification catalyst ", Chem. Commun., 2012,48, 9465-9467, DOI: 10.1039/C2CC34987F, which was followed by Nikkan-kogyo newspaper. Dr. Katsuhiko Ariga (Ariga team, National Institute for Materials Science (NIMS)) created a silica film with a dense upright-sheet network which could allow us to do gene transfection into animal cells in a more efficient and safer manner. A solid gene transfection is an effective method of gene transfer and an animal-derived protein in the extracellular matrix "Fibronectin" has been employed as a useful transfection promoter. However there are hurdles in safety to be cleared as long as this promoter is applied to clinical testing of treatment involving returning of gene-introduced cells into the body. They found that the newly developed silica film with a number of nano-scale upright sheet make it possible to do gene transfection without any promoter. The findings are expected to be applied to cellular therapy such as genetic diseases including inborn error of metabolism and hemophilia, and retractable diseases like diabetes. A paper entitled "Silica-based gene reverse transfection: an upright nanosheet network for promoted DNA delivery to cells " was published on Chemical Communications (2012,48, 8496-8498, DOI: 10.1039/C2CC34289H). NIMS issued a press release on these findings. Professor Naotoshi Nakashima (Nakashima team Kyushu University) studied the recognition and separation of right- and left- handed single walled carbon nanotube (SWNT) enantiomers from synthesized SWNTs using various copolymers composed of polyfuruore units with long alkyl chains (higher SWNTs solubility) and chiral binaphtol units (higher enantiomer sorting capability). They found that the recongintion behavior of enantiomers inverts at higher contents of the chiral naphthol units. These findings were published in a paper entitled "Recognition and one-pot extraction of right- and left-handed semiconducting single-walled carbon nanotube enantiomers using fluorene-binaphthol chiral copolymers"　J. Am. Chem. Soc., 2012, 134 (30), pp 12700-12707DOI: 10.1021/ja304244g. Professor Akira Harada (Harada team, Osaka University) succeeded for the first time in switching of macroscopic molecular recognition selectivity by changing in composition of mixed solvent. Switching of the selectivity of macroscopic assemblies is of increasing importance to produce highly functional materials. They studied it using polyacrylamide gel modified with pyrenyl (Py) moiety (Py-gel) and gels possessing CD moieties (αCD-gel, βCD-gel and γCD-gel) in a mixed solvent of water and dimethyl sulfoxide(DMSO), and found increase in DMSO content caused pyrene's form from dimer to monomer, resulting in stronger host-guest bonding with smaller βCDs A paper titled "Switching of macroscopic molecular recognition selectivity using a mixed solvent system" was published on Nature Communications （Vol.3,Article number:831,DOI:doi:10.1038/ncomms1841) as well as a joint press release of Osaka University and JST. Dr. Katsuhiko Ariga (Ariga team, National Institute for Materials Science (NIMS)) newly created stretchable silica nano-sheet capsules. These capsules can expand or contract with heat as well as can change their nano-sheet layer-layer clearances at their surface by pH adjustment. The capsules could function as a mechanically stable DDS device since they release DOX (anticancer drug) about 5 times as slowly as the current simple porus capsules do. A paper titled "Flake-Shell Capsules: Adjustable Inorganic Structures" was published on Small online (May 7,2012 DOI:10.1002/smll.201200317). NIMS issued a press release on these findings, followed by newspapers such as Nikkei-sangyo, Kyodo-tsushin Hokkaido. In both CREST and PRESTO, "Invitation for Application of Research Proposals(1st Term)" was started.The guidance and Research Supervisor's policy of this research area were posted. Applicantions shall be done by May 9,2012 for PRESTO and May 15,2012 for CREST. The guidance and Research Supervisor's policy of this research area were posted. Professor Shigehiro Yamaguchi （Yamaguchi team, Nagoya University ) and associate professor Atushi Wakamiya (Kyoto University, Presto's research area "Photoenergy conversion systems and materials for the next generation solar cells" directed by a supervisor Shuji Hayase) succeeded in creating planarized triphenylboranes in an unprecedented way. They found these compounds were stable toward air, water and strong acids despite the absence of steric protection in the vertical direction with respect to the B atoms. In addition, upon treatment with a fluoride ion, these compounds underwent a reversible plane-to-bowl conversion in a controlled manner. These planar structural compounds having electron-accepting B atoms at their center are expected to be applied to organic electronics products like solar cells as higher electron-transporting materials. Their findings were published in a paper titled "Planarized Triarylboranes: Stabilization by Structural Constraint and Their Plane-to-Bowl Conversion" J. Am. Chem. Soc., Article ASAP, DOI: 10.1021/ja211944q, Publication Date (Web): February 28, 2012 as well as a joint press release by JST, Nagoya university and Kyoto university, followed by newspapers such as Nikkei-Sangyo, Kagaku-Kogyo Nippo and Nikkan-Kogyo. Professor Hiroshi Sugiyama (Sugiyama Team, Kyoto University） created a nanoscale network of DNA tracks on a rectangular plate known as DNA origami (ca.100x100nm) and succeeded for the first time in navigating a DNA-based molecular motor to a specified goal on the network. They also successfully controlled the direction of the motor at diverging points and observed its movement with the high resolution AFM. This may enable us to control movement of molecules in a designed nano mesoscopic structure and lead to development of molecular transportation and creation of molecular robots. The findings was published in the January 22 online edition of the journal Nature Nanotechnology. Kyoto university issued a press release on this, followed by newspaper reporting such as Asahi, Kyoto and Nikkan-Kogyo. Professor Akira Harada （Harada team, Osaka University ) succeeded in creating a photoregulated assembly system through intermolecular host-guest interaction.. They used polyacrylamide-gels with azobenzene groups (guest) or alpha-cyclodextrin (host) moieties. They observed at a visible scale that when mixed, these gels adhere to each other as trans-azobenzene units get caught in alpha-cyclodextrin pockets. However, once irradiated with the ultra violet light, the gels will segregate due to the azobenzene's change in shape from "trans" to "cis", but adhere again by irradiation of the visible light. In addtion to this, they found for the first time that host molecules can recognize the photostructural change in guest molecules and tend to switch to a more shape-fitted bonding. A paper titled "Photoswitchable gel assembly based on molecular recognition" was published in Nature Communications doi:10.1038/ncomms1617 Published 03 January 2012 as well as a joint press release of Osaka University and JST. News papers such as Nikkei, Yomiuri, Asahi, Mainichi, MSN Sankei, Nikkan-Kogyo and Nikkei-Sangyo reported this finding.